15 GORGEOUS European Castles You’ve Never Heard Of. Newsner » Travel » 15 GORGEOUS European Castles You’ve Never Heard Of. I find castles simply fascinating, as do many. There’s just something magical about them – something that awakens both dreams and imagination. Thankfully, many great monuments remain standing in order to remind us of our history, the epics of our ancestors, and the glory of ancient empires. When thinking of Europe in particular, many of us might think of a romantic weekend in Venice, an elegant dinner in Paris, or a cold beer in Germany. Perhaps might we contemplate seeing the Mona Lisa, or sampling Belgian ale. Yet beyond these cliches linger spectacular places around the continent that are certainly worth a visit… such as these 15 hardly known – but absolutely spectacular castles. 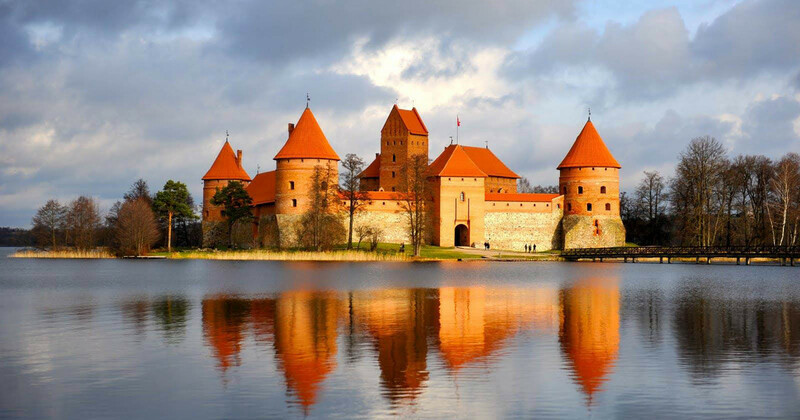 Located 28 kilometres west of Vilnius, the capital of Lithuania, the construction of this magnificent island castle started in the 14th century over several phases. In the early 15th century, major works were completed by Vytautas The Great. Trakai is a beautiful old-town. The place is magnificent and entry tickets are cheap. There is a huge fascinating collection of armor and weapons on display. Padernello Castle is located in Brescia in Lombardy. The castle was built by the Lords of Brescia, the Martinengo family, in 1450. Beautiful reddish orange walls surrounded by green, it looks like a castle from a storybook you read when you were a child. It’s worth the visit. The Mirsky castle is an outstanding example of 16th-century fortification art. It’s located in the town of Mir in the Grodno region of Belarus. Its construction began in 1520 and was completed in 1568. A medieval castle with a nice park and a beautiful lake, it’s a perfect place for entertainment. It’s less than one hour drive away from Minsk. The castle was built by Sir Randal MacDonnell, 1st Earl of Antrim, in 1636, and is still owned by Antrim bloodline till this day. The castle is mostly known for its outstanding gardens. Well laid out with plenty of space to stroll around, and a huge collection of different flowers. The present fortress was constructed between 1300 and 1310 as a defensive base for the capital of Belgium. The Castle area is 80% open to public and for 3 Euro you can go wherever you want. Since its construction in the 12th century, the Haut-Koenigsbourg castle has been a constant witness to both European conflicts and rivalry between lords, kings and emperors. This medieval piece of art is one of the most deep-rooted castles in France, and it’s certainly worth a visit. The Löwenburg “Lion Castle” is one of the most beautiful castles in the world. It’s located in the town Kassel, in the Wilhelmshöhe Mountain Park, on the Bavaria mountain. From a distance it might seem as a Gothic castle from the Middle Ages. But it’s just 250 years old! Next to the city of Ghent, on the bend of Leie river, lies an outstanding piece of art: the elegant Ooidonk Castle. Ooidonk was built in the 13-14th century by the Lords of Nevele, and was burnt twice in the 15th century. Despite the fact that it was built in the 19th century, it’s almost impossible to differentiate it from the older castles for its magnificent Gothic style. It was the last fortified castle built in England. Built in the 12th century, Chateau Vincennes is certainly an important place for the history of France. Easy to access, as it’s located 15 minutes from the center of Paris. The Château de Vitré is a medieval castle in the town of Vitré, built in the 11th century. It’s a fine example of what you expect a castle to look like. It is also a must see, and the museum at this castle is marvelous. Built in the 12th century, Chillon Castle is an island castle located on Lake Geneva, south of Veytauxin the canton of Vaud. If you are in Geneva or any town nearby, then this place is a total must-see: you have such an amazing view of the lake Geneva from the castle.